JUDY KOEMPEL, left, and a fellow nurse at CHLA at a prior blood drive at St. Brendan School. Help patients at Children’s Hospital Los Angeles (CHLA) by donating blood Tues., Oct. 23 at St. Brendan School, 238 S. Manhattan Pl., from 9:30 a.m. to 3:30 p.m. Donations will aid patients at CHLA, which requires 2,000 units of blood each month to meet the needs of its young patients. Donors should be well-hydrated and at least 17 years old and 120 pounds or more and must have a valid photo ID. Judy Koempel, who organizes the event, is a parent at St. Brendan and also has worked at CHLA for over 15 years as a pediatric intensive care nurse. 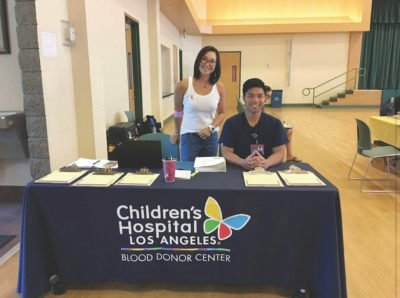 Judy Koempel’s goal is to establish a biannual blood drive each spring and fall and also to help show students at St. Brendan how they can help other children in Los Angeles. To schedule an appointment, sign up online at chladonateblood.org using sponsor code STBRENDAN or contact Judy Koempel at jukoempel@chla.usc.edu.